Amazon Cloud Drive is a way to get around storing your stuff on your own hardware. Instead, you can keep it on someone else's. It this case, Amazon's. IFTTT is a service that automates the way the sites you visit interact with each other. Those letters stand for "If This Then That." Now the two of them are friends. 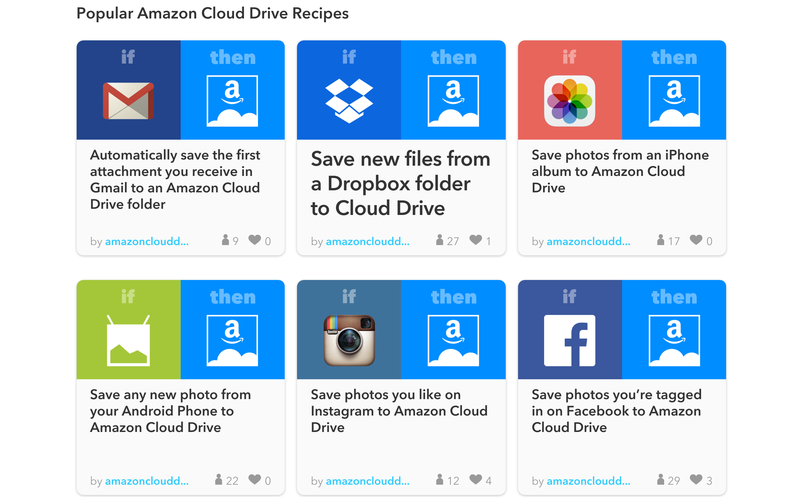 Amazon has announced its new IFTTT channel for Amazon Cloud Drive. Things you could do include automatically taking photos that people tag you in and saving them into a folder on Amazon's servers. Another option would be to take files you upload to Dropbox and have them make their own way to Cloud Drive as well. You've got the idea. Now go have fun.